German books from 1800 - today. 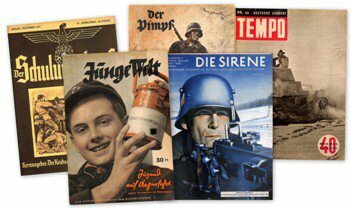 We offer a wide range of German military, policial, art, satire, Third Reich & WWI/ WWII literature. You cannot find the title or issue you want? Feel free to send us a message. We take care for your search list. BOOKS There are 51 products. 11225	THIRD REICH PRIMER	Fibel für die Volksschulen Württembergs	printed 1941 for the region Wurtemberg /South-West Germany)	by Schober, Sigrist, Sohn, Stirner	124 pages	Propagandistic Third Reich reading book for children of the 1st grade. good used condition, loose pages 1-12 in a block.